Zhen Zhuangzhuang, a 32-year-old outdoor enthusiast from Baoding, North China's Hebei province, is making a solo expedition along China's 18,000 kilometers of coastline in a kayak. "I am the first one to start the journey and will record on video all exciting moments along the journey," Zhen said, adding that he has been an outdoors enthusiast for more than a decade and is always eager for new challenges. Experiencing the way to survive under uncertain natural conditions and with limited resources, and to show this to people in modern times is the purpose of his trip, he said. After professional training, Zhen started his journey from the southern port city of Fangchenggang in South China's Guangxi Zhuang autonomous region in 2016 and expects to reach Dandong in Northeast China's Liaoning province in 2018. "My speed is not quite as fast because I also will go to explore places on the mainland whenever I stop for a rest," Zhen said. According to Zhen, except for recording moments on the water, he will also record some traditional customs and natural scenery in places he stays. 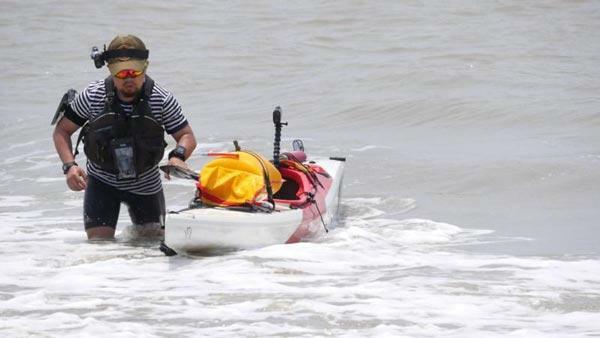 Zhen said he rows the kayak more than 14,000 times each day and has finished 2,000 kilometers along the coastline. Although frequently meeting with various difficulties, he doesn't want to stop. "This is the meaning of exploring the unknown," he said. 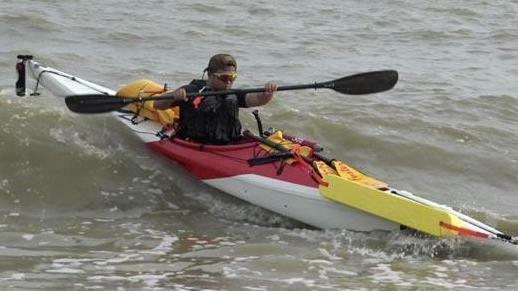 Zhen Zhuangzhuang rows a kayak along part of China's 18,000-kilometer coastline.